This appeal to the “learned” to get involved, to “say something,” and to share their learning about how to bring about progress, appeared in the Iranian state newspaper, Ettela`, published in Tehran. It was an attempt by the newspaper to present itself as a forum that could reflect the opinions of its intended audience, and thus to gain their trust. Ettela` further claimed that it was free from “all official constraints” and that it would publish any article that was sent in to the newspaper as long as “it was useful to the nation and did not defy religion and state.” The evidence suggests that readers were skeptical about Ettela`’s appeals, yet Ettela` persisted and would repeat its appeal periodically. That Ettela` repeatedly solicited reader contributions was paradoxical in a number of ways. First, it was a departure from past practice in Iran. 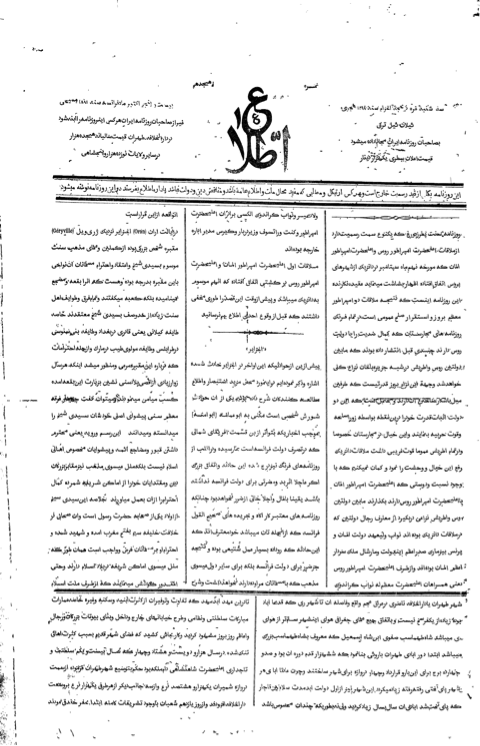 When the first government newspaper, Vaqaye`-e Ettefaqiyeh, for example, began publication in 1851, its explicit aim had been to inform the “inhabitants of the domains of Persia (mamalek-e Iran)” of the decrees of state. In subsequent years, when Vaqaye`-e Ettefaqiyeh went through a number of reincarnations in terms of name, style, and patronage, and by the mid-1860s, became one of four official newspapers, there was no evidence of any concern with winning a reading public. After all, a readership for these newspapers was ensured as a result of a requirement that all government employees and officials subscribe to at least three of the four newspapers. Those found to have been noncompliant were penalized by having to forego the equivalent of the cost of subscription from their government salaries. Secondly, the founder and publisher of Ettela` was Mirza Mohammad Hasan Khan E`temad al-Saltaneh. He was not only a confidant of the shah and in charge of the Ministry of Publications, a government office that had the task of overseeing all the material that was to appear in the state-sponsored newspapers prior to publication at this time, but a few years later, in order to ingratiate himself with the shah, and inspired by the censorship laws in Europe, he would launch Iran’s first bureau of censorship. So why did a state-sponsored newspaper like Ettela` suddenly see it as necessary to engage a readership and why was this important? Akhtar, a Persian-language newspaper, was first published in Istanbul in 1876. From the 1870s onward, the world in which Iran found itself was increasingly interconnected. Not only had the introduction of new communication networks such as the telegraph helped to expose the towns and the cities of Iran progressively to the wider world, but in the domain of print-culture too, the state-run press could no longer pretend to constitute the only source of news within the country. A range of European newspapers had become available, at least in some elite circles. More importantly, Persian-language newspapers published outside the country had begun to appear and to gain a following among broader segments of the population in Iran. In due course, these expatriate newspapers, published in Istanbul, London, Calcutta, Cairo, and Baku, would represent an independent press that went beyond the reach of Qajar court censors, raising political consciousness and providing a forum for the discussion of new ideas. By the early 1880s, when Ettela` made its public appeal, the first Persian-language expatriate newspaper had begun publication. 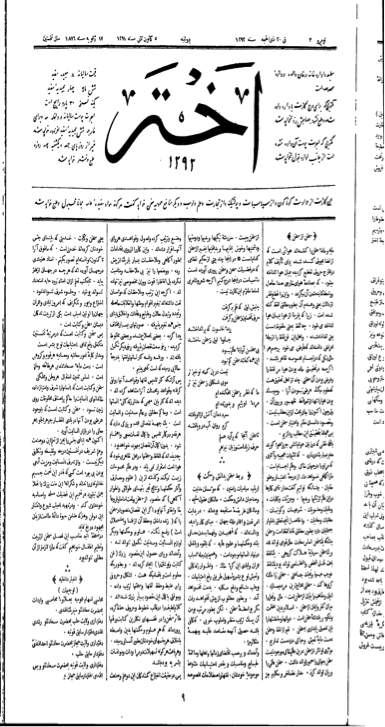 Titled Akhtar, this newspaper had first appeared in 1876 in Istanbul, and in less than ten years, had gained the trust of quite a few readers in Iran. Although Akhtar was not particularly radical in tone, it had struck a chord because in addition to translating and publishing articles from the foreign press that were critical of the Iranian government, it invited contributions and/or letters from readers both inside and outside Iran. According to one contemporary, Yahya Dawlatabadi, Akhtar had caught people’s attention because it published articles sent from Iran, especially from those who were dissatisfied with the state of Iran’s government. While in most cases, these articles were published anonymously, rumors often attributed them to reform-minded officials within court circles. This development both incurred the shah’s wrath, and also undermined his grip on power. In short, the new reality that what was published in Istanbul could now be read and discussed in Iran, meant that not only was the state no longer in control of the dissemination of information, but also that it could not remain impervious to public opinion. Ettela` was thus a response to Akhtar, both as a means to project a more favorable image of the country, and also to provide an alternative forum to answer the allegations made by Akhtar. However, in order to succeed, Ettela` had to try to win over a readership that would otherwise have been drawn to expatriate publications such as Akhtar. Ettela`, therefore, saw itself in competition with Akhtar. As a result, it had to make sure that it took measures to retain its subscribers. It thus made a point of publishing on time, and encouraged its readers to write in, stating that it would publish “letters or contributions about anyone or any place, providing news of misdeeds and wrongdoings of any official… without revealing the name of the writer.” Ettela`, in addition, changed its look from lithograph to type, both so as to make it easier to read, and also to be on par with the “best newspapers in Istanbul and Europe.” This element of rivalry was not lost on readers; on a number of occasions, when critical letters were sent to Ettela`, they were accompanied by taunts that if the letter did not get published in Ettela`, it would be sent to Akhtar with the next post. Conversely, at times, when contributions were not accepted by Akhtar, they were published in Ettela`. Ettela` was first published in Tehran in 1881. Ettela`, in short, was proof of the changing times in the 1880s; Ettela`, after all, represented the first instance of a state newspaper giving recognition to the fact that it was the reading public that ultimately legitimized and made a newspaper viable. By appealing to readers, even if they were limited to an imagined circle of the educated and the well-to-do, and projecting itself as a forum for the expression of ideas, Ettela` had given expression to the idea of a public, and to the newspaper as a public space where there could be limited exchange. While Ettela` never gained the popularity or indeed the trust that it sought among readers, it had started a conversation within Iran about what constituted a newspaper culture. At the same time, a view had gained ground among the reform-minded in Iran that a literate public was the key to a prosperous country, and that learning in general and the printed word, in particular, could bring about progress. Newspapers were thus said to open “the eyes and the ears of the people” and make them aware of the wider world and the times that they lived in. Therefore, when by the turn of the century, a seemingly lax political climate that followed the accession of a new king in 1896 led to some optimism about the possibility of change and the power of newspapers to bring this about, privately-owned newspapers began to appear in Iran. While these newspapers were subject to censorship, and restricted in what they could print, they could not remain impervious to either the goings-on in the world or the element of competition from new newspapers, whether published outside or inside the country. Moreover, in order to ensure that they were relevant, these new newspapers had to win over, if not entirely create a reading public. It was in this context that questions of affordability and accessibility to a broader public that also included the less educated became issues of concern for newspapers in a way that they had never before. 1 Ettela`, no. 30, 19 March 1882, p. 4. Negin Nabavi, Elizabeth and J. Richardson Dilworth Fellow and Member in the School of Historical Studies, explores the shaping of publics and public spheres in the context of late nineteenth- and early twentieth-century Iran. Nabavi is Associate Professor of History at Montclair State University.